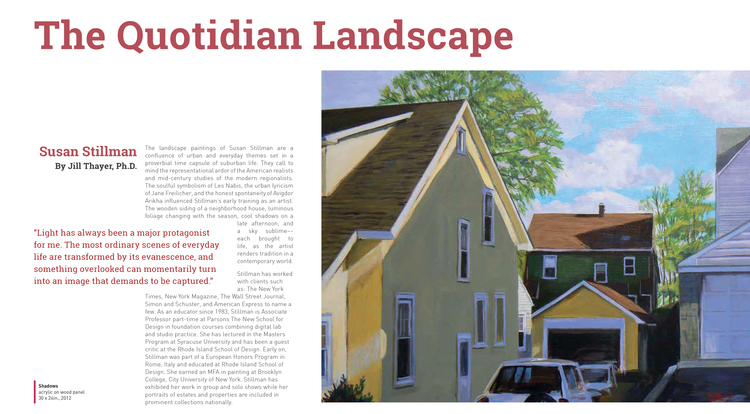 The Quotidian Landscape: A Conversation with Susan Stillman | Jill Thayer, Ph.D.
October 19, 2015 · by Jill Thayer, Ph.D. 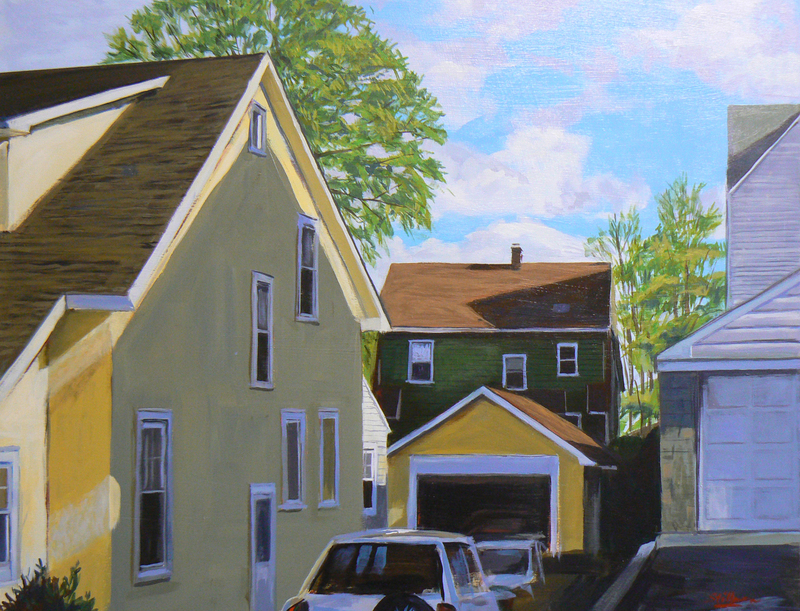 The landscape paintings of Susan Stillman are a confluence of urban and everyday themes set in a proverbial time capsule of suburban life. They call to mind the representational ardor of the American realists and mid-century studies of the modern regionalists. The soulful symbolism of Les Nabis, the urban lyricism of Jane Freilicher, and the honest spontaneity of Avigdor Arikha influenced Stillman’s early training as an artist. 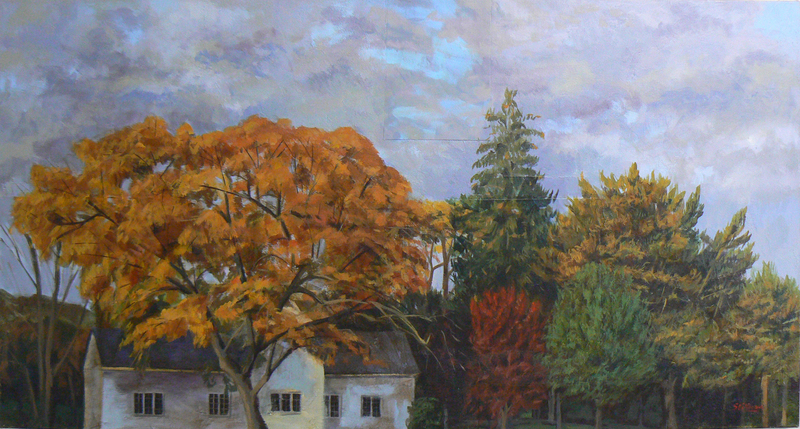 The wooden siding of a neighborhood house, luminous foliage changing with the season, cool shadows on a late afternoon, and a sky sublime––each brought to life, as the artist renders tradition in a contemporary world. Stillman has worked with clients such as: The New York Times, New York Magazine, The Wall Street Journal, Simon and Schuster, and American Express to name a few. 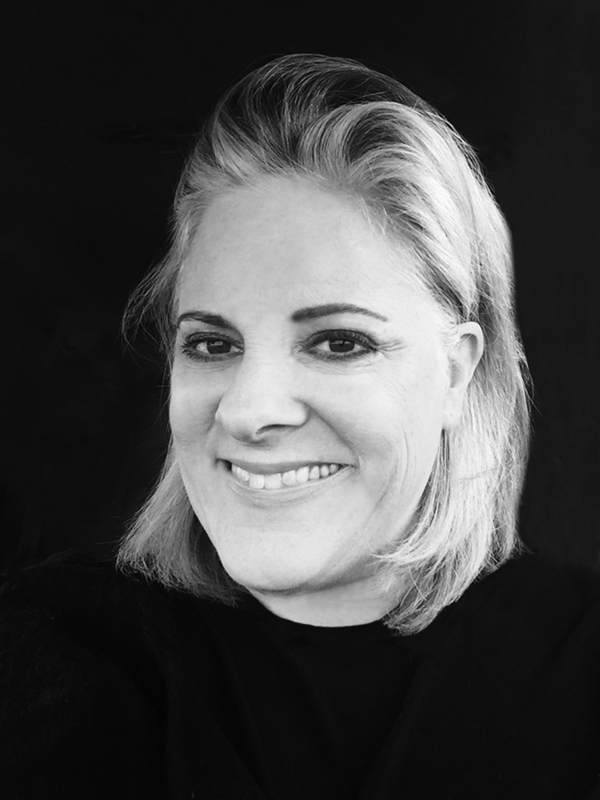 As an educator since 1983, Stillman is Associate Professor part-time at Parsons The New School for Design in foundation courses combining digital lab and studio practice. She has lectured in the Masters Program at Syracuse University and has been a guest critic at the Rhode Island School of Design. Early on, Stillman was part of a European Honors Program in Rome, Italy and educated at Rhode Island School of Design. She earned an MFA in painting at Brooklyn College, City University of New York. Stillman has exhibited her work in group and solo shows while her portraits of estates and properties are included in prominent collections nationally. I interviewed the artist from her studio in White Plains, New York as she shared her perspectives and insights behind the painted canvas. 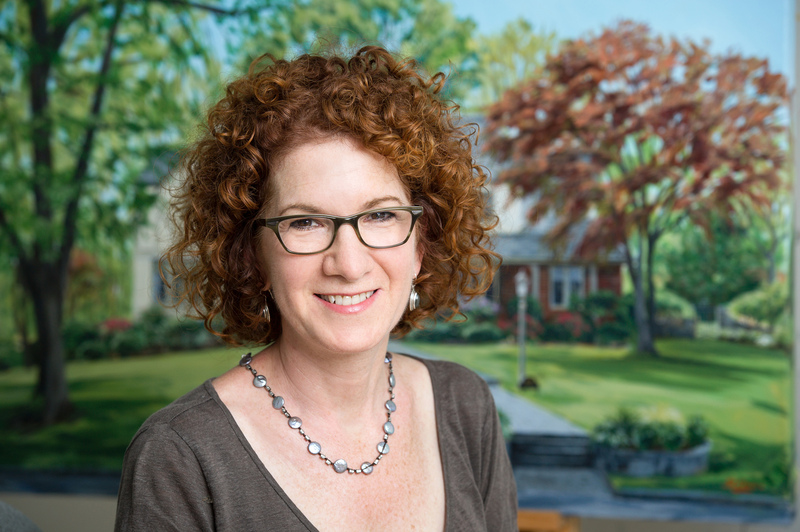 Jill Thayer: What influences led to your combined path as an artist and illustrator? Susan Stillman: It began for me with the figure. I was life drawing and studying anatomy in my early teens, and knew instinctively that my path would be in the visual arts. Illustration was a natural choice for a figurative artist in New York in the early 80’s. JT: Do these genres inform each other or are they two disparate disciplines? SS: Illustration has historically been a starting point for many painters. We have to make a living, and it was a way to be independent making art, both for the market and for oneself. I moved years ago from free-lance illustration to being a painter full-time, supporting myself painting commissions of homes, an entrepreneurial idea which evolved from my personal work. JT: What was the turning point in your career that brought you to a higher level of awareness? SS: In the beginning my focus was drawing. I was always a painter, but really didn’t begin to work as a colorist until seven or eight years into my career. It was then that I fell in love with the landscape. I am attuned to that moment of recognition, when all elements in my view crystalize and I feel perfect balance. 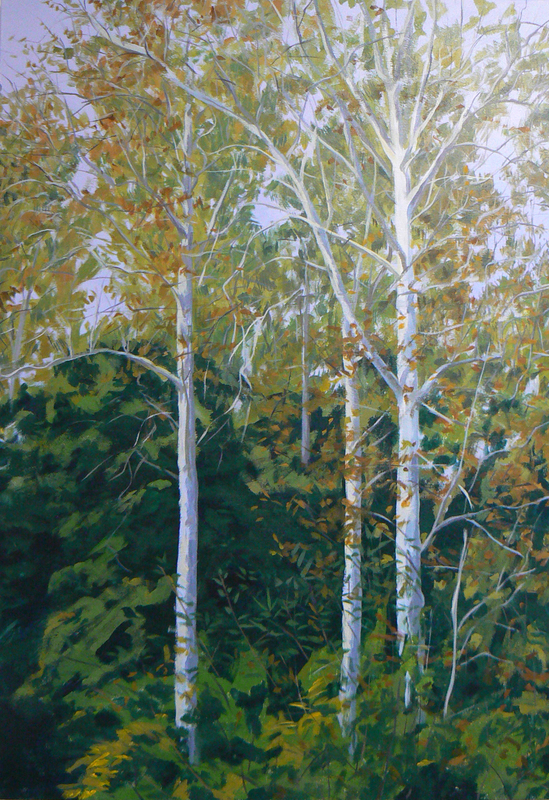 JT: There is a regionalist quality in your work with the luminosity of an impressionist landscape painting. Do you see yourself as a realist? SS: I am, of course, but there is abstraction in everything––in the framing of the composition, in the contrast of the smooth architectural shapes with the variety of the foliage textures, and also in the color relationships. JT: Could you share your process and approach? SS: The absence of figure eliminates any narrative. The work is pure observation, with no implied content or story. I’m not drawn to the romantic landscape, but to the everyday in my own surroundings. It’s the challenge of seeing the ordinary in a moment of illumination that drives me. JT: What is the scale of your work? SS: I like to work quite large, as the scale can provocatively contradict the ordinariness of the subject. Some recent smaller scale paintings allow more intimacy, and encourage an exploration of fragmentary compositions. 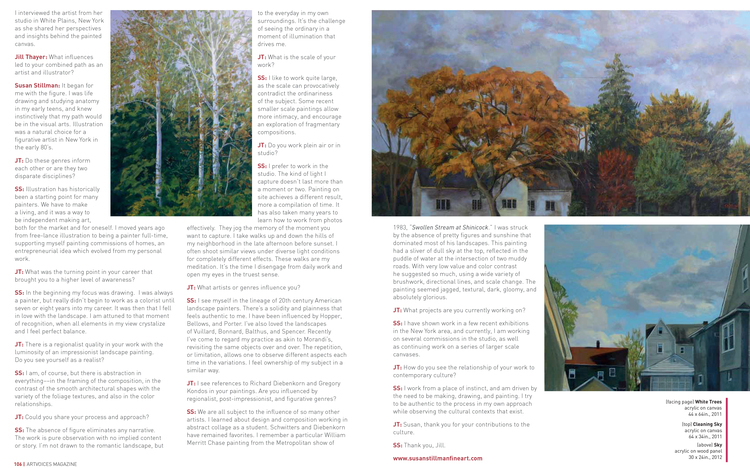 JT: Do you work plein air or in studio? SS I prefer to work in the studio. The kind of light I capture doesn’t last more than a moment or two. Painting on site achieves a different result, more a compilation of time. It has also taken many years to learn how to work from photos effectively. They jog the memory of the moment you want to capture. I take walks up and down the hills of my neighborhood in the late afternoon before sunset. I often shoot similar views under diverse light conditions for completely different effects. These walks are my meditation. It’s the time I disengage from daily work and open my eyes in the truest sense. JT: What artists or genres influence you? SS: I see myself in the lineage of 20th century American landscape painters. There’s a solidity and plainness that feels authentic to me. 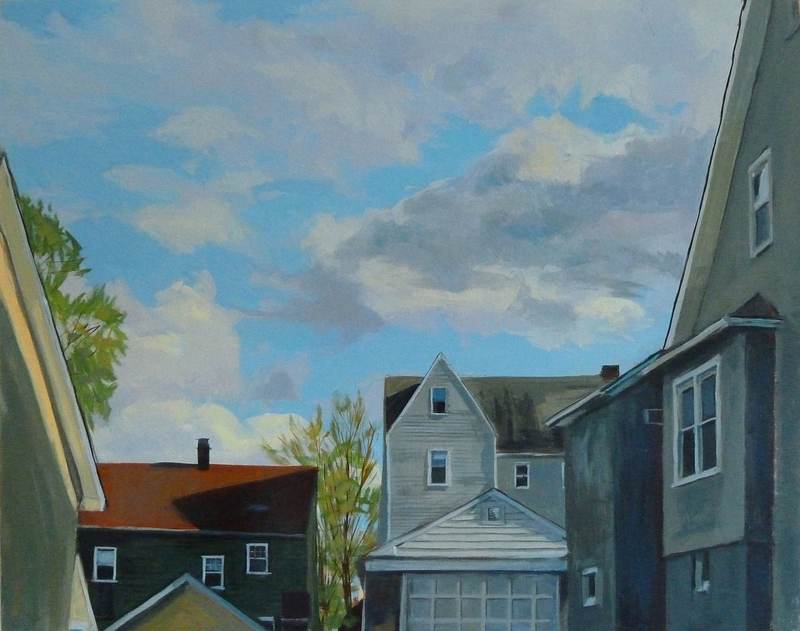 I have been influenced by Hopper, Bellows, and Porter. I’ve also loved the landscapes of Vuillard, Bonnard, Balthus, and Spencer. Recently I’ve come to regard my practice as akin to Morandi’s, revisiting the same objects over and over. The repetition, or limitation, allows one to observe different aspects each time in the variations. I feel ownership of my subject in a similar way. JT: I see references to Richard Diebenkorn and Gregory Kondos in your paintings. Are you influenced by regionalist, post-impressionist, and figurative genres? SS: We are all subject to the influence of so many other artists. I learned about design and composition working in abstract collage as a student. Schwitters and Diebenkorn have remained favorites. I remember a particular William Merritt Chase painting from the Metropolitan show of 1983, “Swollen Stream at Shinicock.” I was struck by the absence of pretty figures and sunshine that dominated most of his landscapes. This painting had a sliver of dull sky at the top, reflected in the puddle of water at the intersection of two muddy roads. With very low value and color contrast he suggested so much, using a wide variety of brushwork, directional lines, and scale change. The painting seemed jagged, textural, dark, gloomy, and absolutely glorious. JT: What projects are you currently working on? SS: I have shown work in a few recent exhibitions in the New York area, and currently, I am working on several commissions in the studio, as well as continuing work on a series of larger scale canvases. JT: How do you see the relationship of your work to contemporary culture? SS: I work from a place of instinct, and am driven by the need to be making, drawing, and painting. I try to be authentic to the process in my own approach while observing the cultural contexts that exist. JT: Susan, thank you for your contributions to the culture. 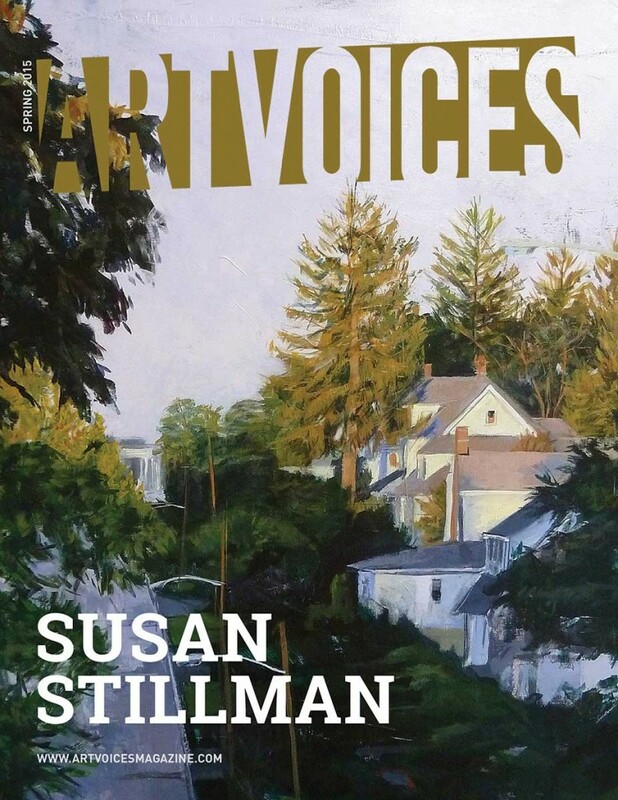 This entry was posted in Uncategorized and tagged Art, Art History, Artist Emergence, Artist Interviews, Artist Profiles, Artvoices Magazine, Jill Thayer Ph.D., Susan Stillman. Bookmark the permalink.